We are very proud of our Allamakee cemetery records. A tremendous amount of work has gone into making them available. Thank-you to the many volunteers who have been involved in bringing these records to on-line researchers all over the world! Additional and updated burial information for some cemeteries have been contributed as well. Below is the menu of our cemetery records. *Additional burial records & other cemetery info. Woodmansee Notes - Researchers, be sure to check these notes!! User-contributed information highlighting errors, conflicting information or descrepancies found in the Woodmansee book. Researchers: Browsing the burial records by cemetery & reading the submitted notes is important, so do not rely completely on this index. Also there are additional burial records that were not included in Woodmansee. 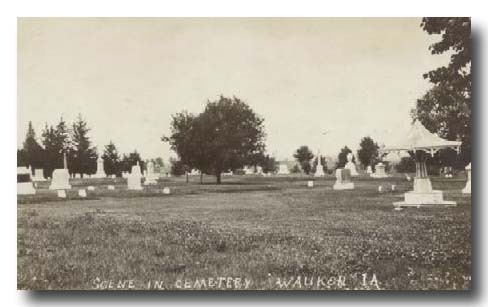 A directory of Allamakee county cemeteries where gravestone photos have been shared by volunteers. Clicking the link will open a new window.